It’s been quite a journey from carrying out the AI on Sissy back in September 2016 right through to selling the pork produced. This wasn’t the first time I’d done AI on our Tamworth sows and the previous attempts had all been successful so the pressure was on to maintain the 100% success rate. 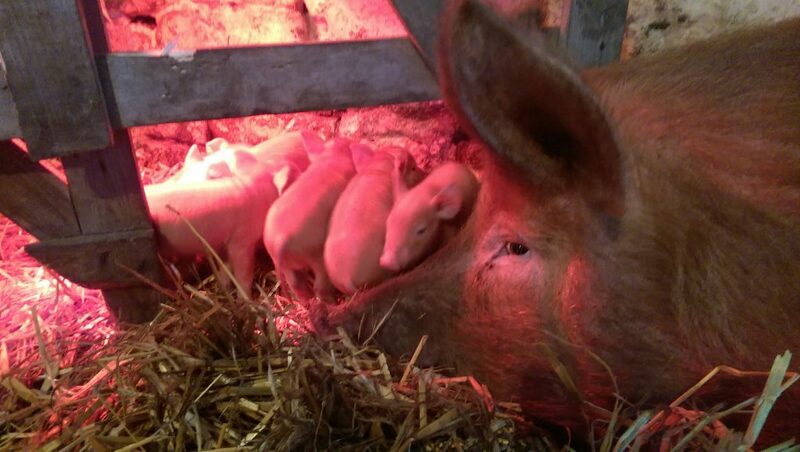 There have been a succession of big events from the AI in September 2016 to the farrowing in mid-January 2017 then on to weaning the litter in early March 2017 and taking the first two to slaughter in August 2017. Although there were only 6 surviving from this litter, the smaller number meant that each one was likely to do better as a result of the reduced competition for milk. In the end we sold two of these as weaners at 8 weeks old and that helped to keep our overall pig numbers at a manageable level for a time. The other main concern was to spread out the trips to the abattoir so that we didn’t end up with lots of pork turning up all at the same time. The first two weaners went off in mid-August and the last two are currently scheduled to go early in October. The planning for this next batch has been crucial because we will have our first Dexter steer going to slaughter in early November as well and our available freezer space becomes more limited at this time of year. We’ve been very fortunate to have quite a few new customers for this first batch of pork and the preparations before sending the pigs to slaughter have worked well so far. 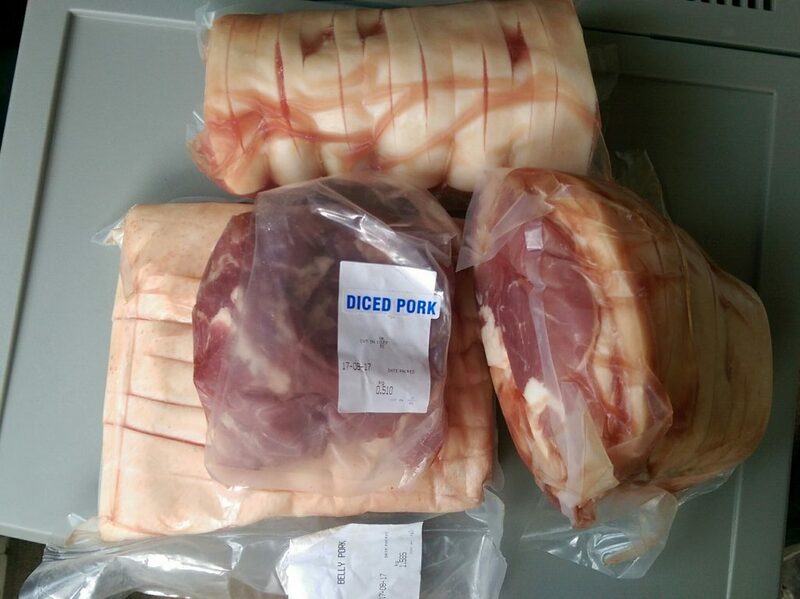 There have been some great comments from satisfied customers and the next batch of pork will hopefully prove to be just as popular. 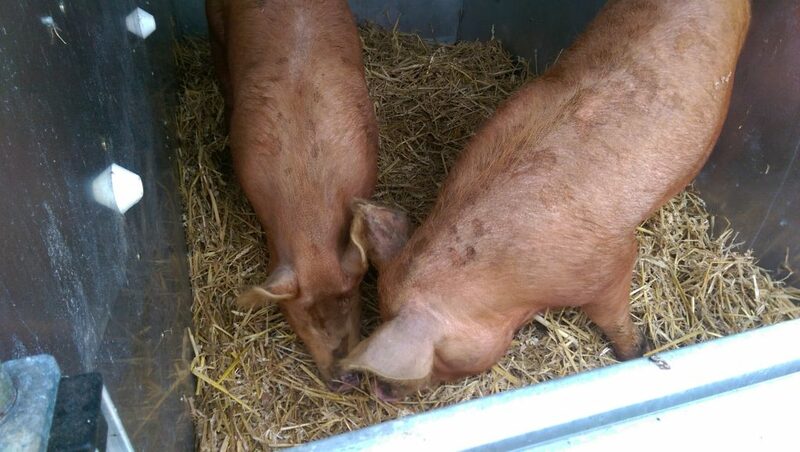 One benefit of delaying the departure of the last two weaners from this litter is that we hope to produce some bacon. I’ve done this in the past just for our own consumption at home and I’ve always been very impressed with the way it’s turned out. However to get the best results you need to start with a larger pig to get decent sized cuts from the loin for back bacon. 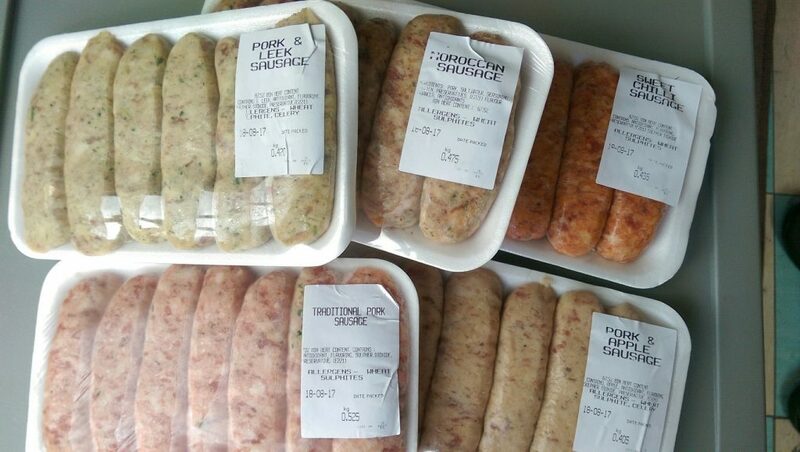 Another lesson learned from the first batch of pork was that sausages are always a popular choice but, surprisingly to me, the plainer flavours (Traditional, Pork and Leek etc.) are still the most popular. We had some packs of Moroccan and Sweet Chilli flavoured sausages made and these have sold pretty well but we still sold out of the Traditional flavour first! This time around we will be trying out a different abattoir and getting the carcasses processed by the local village butcher. In the spirit of reducing food miles, this means that the pork will be from pigs that have been conceived, born, raised and butchered in a 1 mile radius of our village. I’m curious to see the results of this alternate approach but we definitely need an alternative option for the future if we are ever unable to use the original abattoir for any reason.